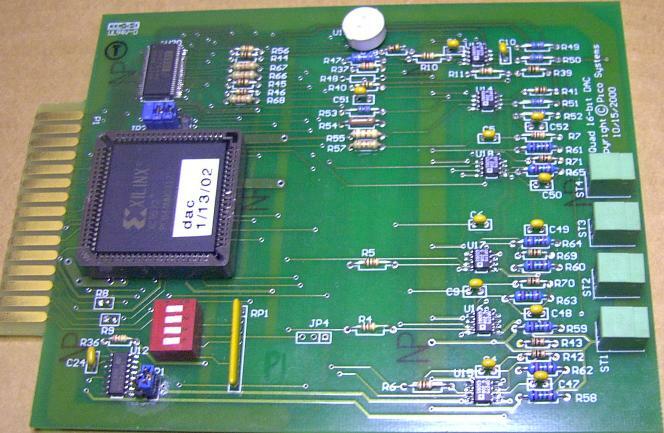 This board is a 4-channel 16-bit Digital to Analog Converter. It is optimized for use with Servo motion control systems as a velocity command DAC. It produces outputs over a range of -10 to +10 Volts. Control is through a bi-directional parallel port, with signals connected via the PPMC motherboard. The board has a 4-position DIP switch to set the range of addresses the board responds to. It occupies a block of 16 Byte addresses. This allows more than one DAC-16 to be used in a system, to obtain more than 4 axes of servo-controlled motion. The DAC-16 board uses a precision teperature-controlled voltage reference and precision operational amplifiers to guarantee minimum drift of voltage levels over short and long time spans, as well as temperature changes. 4 data holding registers are provided so that all DACs can be updated simultaneously, either by software command or by an signal on the PPMC motherboard from a master interrupt timer. The board has a timeout circuit which can detect a failure of the computer to supply a continuous stream of servo velocity updates. When the timeout is enabled, and the computer fails to update the DAC regularly, then all 4 DAC outputs are set to zero volts, and an emergency stop signal is sent through the PPMC motherboard to emergency stop logic on the digital I/O board. The timeout function can be disabled by a jumper setting to make DC calibration and other testing easier.